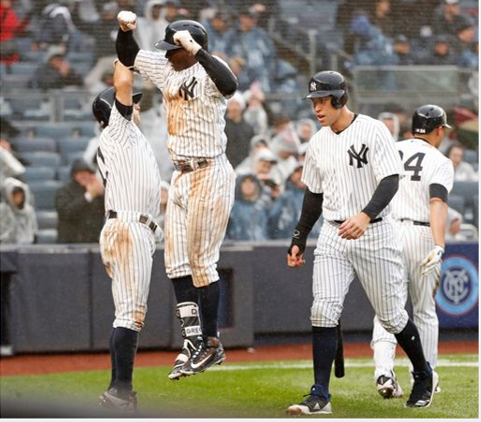 The Yankees are LUCKY to have Didi Gregorius on the ROSTER or else they would have been EMBARRASSED on Opening Day in the COLD and RAIN. The Yankees were able to OVERCOME another CHOKE from their Bullpen. The Yankees and the Devil Rays were supposed to be play their FIRST game of the series on Monday Afternoon but SNOW forced the game to be POSTPONED to this afternoon and it was an UNCONVENTIONAL start to Yankees’ home schedule. It was RAINY at first pitch in the Bronx, so the Yankees had NO ceremonies for Opening Day and they did not do introductions in the FIRST home game of manager Aaron Boone and STAR player Giancarlo Stanton. Jordan Montgomery was making his season debut in his SOPHOMORE season and he did a GREAT job giving up only ONE run in his FIVE inning start. The Yankees were WINNING 4-1, when Monty was PULLED so he was SET for his FIRST win of the season but the “GREAT” Yankees bullpen had OTHER ideas. For the THIRD game in a ROW the Bullpen IMPLODED and they gave up the lead in this game. If not for Didi the Yankees were looking at their THIRD loss of the season in a row. Didi Gregorious has been TASKED with batting in the MIDDLE of the Yankees lineup and he is the BEST at it, he had EIGHT RBI’s today and was that was the DIFFERENCE in this game. He had TWO 3-run home runs and had a 2-Run Single in the Eighth inning to put this game out of QUESTION. Didi was a GOD send for the Yankees this season or things would have been a DISASTER for the Yankees offense. Stanton went 0 for 5 with FIVE strikeouts in his FIRST game at Yankee Stadium in Pinstripes, the FEW fans that stayed till the END of the game BOOed him after he STRUCK OUT with the Bases LOADED in the Eighth inning. I think Stanton is going to be GREAT at Yankee Stadium but it was a TERRIBLE omen for him to have his WORST game of his career after dawning the Pinstripes for the FIRST time. These TWO teams will come back to the Stadium tomorrow afternoon for the LAST game of the series but RAIN is in the forecast so we are set up for ANOTHER game in SLOPPY conditions again tomorrow. The Yankees should CELEBRATE their Win tonight and get ready to win again tomorrow to get on a ROLL against EASY opponents like the Devil Rays.